GBA Advance Wars (USA v1.0) in 13:33.39 by Kiske & mtvf1. 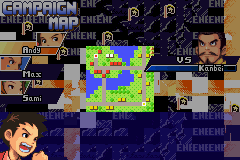 Using a glitch in the design maps mode of the game, this run by Kiske and mtvf1 completes the game impossibly quickly by forcing opponents to yield, allowing instant wins in the campaign missions. The author also improves the previous run by 12.80 seconds through new tricks and better use of the "force surrender" glitch.